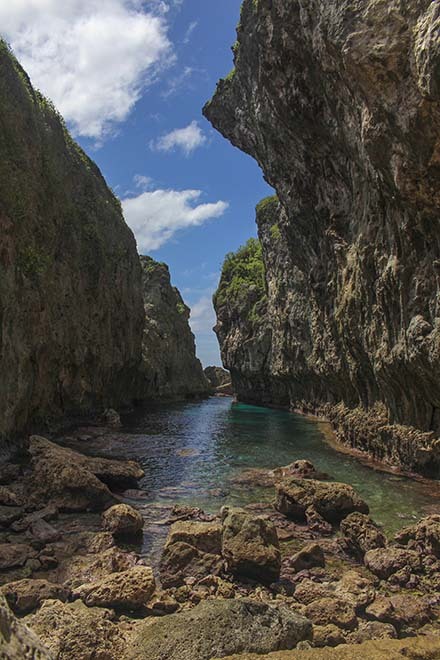 Our anchorage on the south east corner of Niue was perfect. We got a great nights sleep and in the morning woke up to find the wind had rotated around to the south quicker than expected. We had breakfast and set off on a slow journey around the northern end of the island. We were in no hurry as we needed the swell to die off on the west coast and that would take hours, if not days. The wind also needed to back further to the east. As always we had the rod in to see if we could catch a fish. We really wanted to catch something that we could take on land and share with some of the locals. They had no fish on the island so we would be very welcome if we could provide some. So we were pretty excited when we hooked up a sizeable fish. 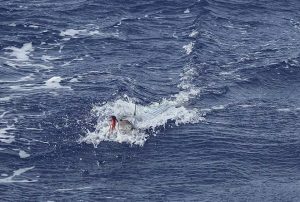 Sailing along, I got him tired enough that he was on the surface and I’m battling away and then I see a shark make pass after pass at it. It was seriously checking it out, however I think due to the size, it didn’t take up the offer. We got the fish to the back of the boat, it was a 1.4m Wahoo (Spanish Mackeral). What a fish……except as I went to lift it up, the leader snapped and I watched the fish disappear into the dark blue again. What a shame. With a big shark in the water, I wasn’t going to dive in to try and catch it. Hopefully he survived, otherwise Mr Shark had a nice meal. As we sailed along the east coast the scenery was stunning. The coastline is so rugged as the waves have carved out caves and pinnacles everywhere. Around the north side it got even better and you could see the tourist attractions of the arches and caves that we hoped to visit in the next couple of days. Annika’s pictures tell a great story here. Words can’t describe it well enough. 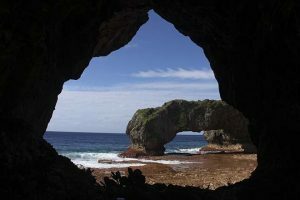 We came to the conclusion that if you get to Niue, you have to take a boat trip around the north coast. It is spectacular with the blue water crashing onto the reef in front of limestone cliff faces with caves carved out in them and then all topped with greenery. And there were plenty of dolphins on the bow too, clearly visible through the deep blue waters. .
We got back into Alofi bay and the swell was still rolling a little but the wind had swung right around and hence the rolling swell on a mooring might be uncomfortable for a few nights, however the boat wasn’t jerking on the mooring like it had been when we had wind chop driving into the bay. That afternoon we stayed on the boat, we would go ashore in the morning when the swell had abated a little more. The following morning and we had our exciting haul out of the tender at the wharf. It was always fun running up to the hook of the crane, turning off the outboard and hooking up whilst you are judging swells, all in one motion. Annika was in the boat this time while I ran the crane. We went and did a little bit of internet at the yacht club and then made our way down to Alofi Car Rentals. 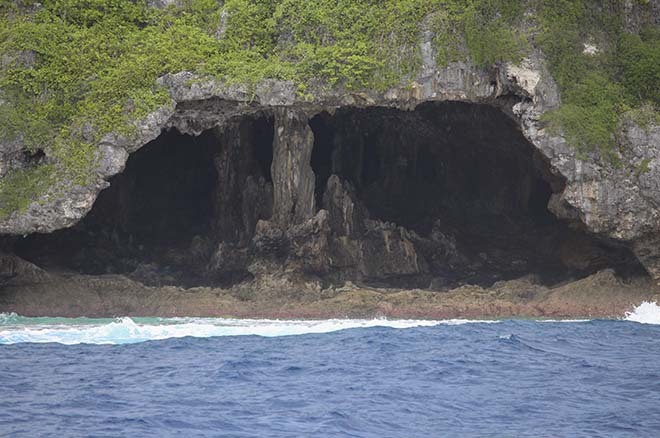 We had been told that they are also the home of the newest dive operation, Magical Niue. We walked in as we wanted to rent a car as well as organize some diving. We met Julz who was ultra friendly and she said her partner Remi wanted to go and check out other dive sites and was looking for divers to go with him. We struck up a deal that would see us go with him, we would provide photos for them, as well as help them installing some of the yacht moorings for the yacht club. That would happen during the week. Over the weekend we would rent a car to explore the land. The following morning we picked up our rental and made our way north to where most of the tourist attractions are. The signage is pretty awesome in this place. Blue signs you can’t miss. As you drive along you see lots of abandoned houses that have been destroyed. Back in 2004, cyclone Heta came through wreaking havoc with the island. With winds from the west at over 300kmh the waves pushed up on the cliff face and the wind held them there. Then the next wave would build up on that and this kept happening until 40m up on the rock, houses had 1m of water through them. It is stunning to think how this could happen. Mother-nature really is a force to reckon with. After this tragedy, a lot of people simply packed up what little they had left and headed to New Zealand. Only 2 people died, a mother and daughter, however the devastation to the little island was massive. Now the population is somewhere between 1100 and 1500, we couldn’t find out exactly. 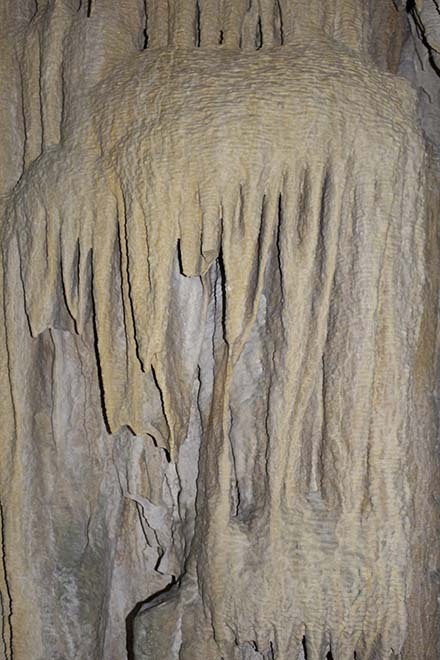 Our first stop was Palaha Cave. 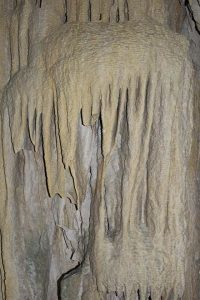 A short walk leads you into a huge cave where stalagmites rise from the floor, reaching to the stalactites clinging from the ceiling. All this with a window to the ocean. It is truly spectacular. It was just the beginning though. Next up we drove over to Tauei Fort. It’s not the type of fort you would imagine, this is not military. 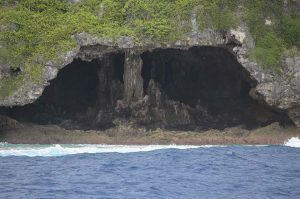 It was a place where Nukai Peniamina was put into hiding and guarded by locals. Peniamina was a local who went off to Tonga and became a priest. He brought religion back to the island and some locals wanted to kill him however he managed to convert the island and is famous for doing so. Religion is very strong on the island still, with most locals going to church twice on a Sunday. Our timing was all about getting to Matapa Chasm at midday where the sun would shine into the chasm directly from above, and to get to other attractions at low tide (middle of the afternoon). We had been told this at the tourist information center and it is really important to listen and do this as it makes the attractions so much better. Matapa Chasm was next on the agenda and a short walk leads you down into the chasm where you can go for a snorkel. The walls rise up either side around 10-15m and a series of rocks at the end block off the access to the ocean. The water was somewhat ‘fresh’ as we jumped in. By fresh I mean cold, but it was also fresh water. A layer of fresh water sat on top and caused a thermocline. As you dived down you could find warmer salt water underneath, so we did that a lot to stay warm. After this we went back to the car, dried up and then went on a walk to Talava Arches. This is one of the main attractions of this island. They were put on a postage stamp several years ago and became world famous. 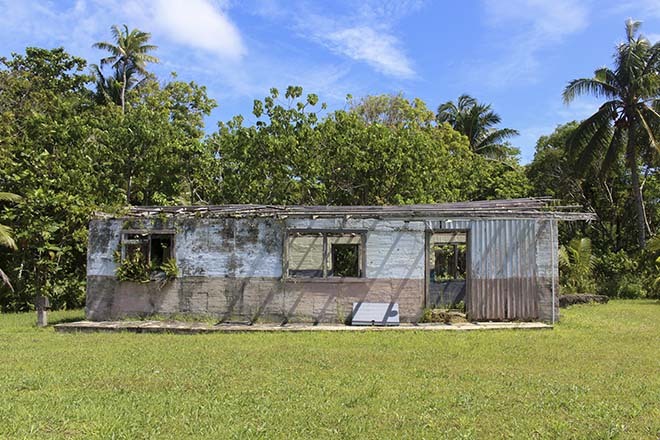 In fact postage stamps from Niue are collectors items around the world, so make sure you send lots of postcards. The signs say the walk is 45 minutes however it took us no more than 20 minutes. It takes you through all sorts of vegetation and it is a walk you need good solid shoes on, lucky we had our Keen shoes. It’s not a hard walk, just a bit rough under foot. 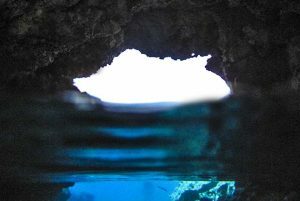 At the end you come across a small entrance to a cave and then it opens up into these magnificent arches that look out over the water. Seeing them from the water the other day only enhanced the experience. We could’ve sat there all day, it was a truly special place. We did sit for quite some time just looking out at the waves crashing against the reef. After a while we walked back to the car and made our way down to Limu Pools. This is a set of pools inside the reef, with the northern one having a tunnel that leads to the outer reef. We jumped in for a snorkel in the northern pool but didn’t go outside the reef as the swell was surging a little too much through the narrow gap. Once again the fresh water sat on top, yet the corals were fantastic, all juvenile and you could see they had only been growing probably since cyclone Heta came through in 2004. After a swim in the northern pool we went to check out the southern pool and saw a couple of sea snakes so I jumped in, wanting to get footage of them on the GoPro. Sea snakes are amongst the most poisonous snakes in the world, however they are not aggressive. Most people say they can only bite you on the webbing between fingers and toes, however I disagree. They eat whole fish and can open their mouths for that so I am sure if they wanted to, they could bite us. But they have no interest in us. I easily chased one of them and then another swam straight at a backpacker who was standing in the water. She stood still and it simply swam straight through her legs. Awesome. We were pretty tired after this so we went back to the boat for the night. There was plenty more to explore the following day and with the island being so small, it would be easy to get around the rest of the attractions tomorrow, O.K we weren’t spending a lot of time at the attractions but we were still taking our time enjoying what Niue had to offer. It had already moved to the most beautiful place we had been on this trip. And the people were friendly too and that makes a place in my opinion. 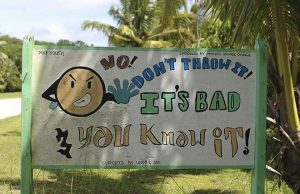 One of the great things with this place is that they know how to deal with rubbish. It is a clean place and all over the island are signs telling you not to litter. You see very little litter anywhere. It was nice to see such a paradise actually clean. After French Polynesia, it was a great change. In our next edition, we spend day 2 on the land. 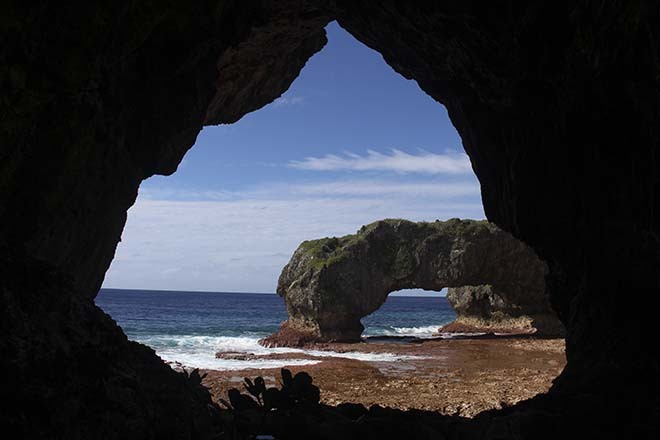 I’ve needed to split Niue up into lots of articles as there is too much to write about!